After more than two decades of work on African peace and security, the Institute for Security Studies (ISS) recently unveiled Elect the Council: an ambitious initiative to reform the United Nations Security Council (UNSC). The latest version of the proposals, the third, is now available for comment and input on the Elect the Council website. This is still work in progress, and a revised fourth version can be expected during September/October. The ISS view is that progress in New York is only possible if two-thirds of the member states of UN General Assembly (UNGA) confront the five permanent members (P5) with a set of specific proposals on reform. Despite sincere efforts over several decades, this has thus far proven impossible. The competing interests of the 193 UN member states have created a situation where the current chairperson of the intergovernmental process on UNSC reform, Jamaican Ambassador Courtenay Rattray, encounters substantial disagreement on literally any aspect of reform. 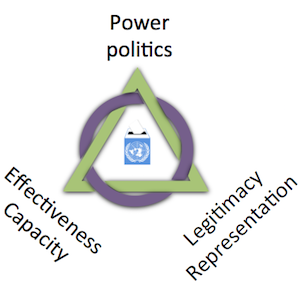 The national interests of aspiring big powers such as India and Brazil; the pursuit of a permanent seat by other large contributors to the UN system, such as Germany and Japan; and numerous competing and overlapping groupings (such as the African Group, the L69 and others) leads states to block any efforts at reform that don’t take their interests into account. 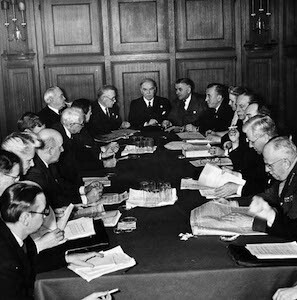 A number of second-tier countries (such as Italy, Argentina, Korea and others) are solidly opposed to regional leaders such as Germany, Brazil and Japan gaining any type of permanent seat (with or without the veto). The competition in Africa is no less fierce, with a number of African countries working informally with other groups to frustrate the ambitions of Nigeria, South Africa and Egypt – generally seen as the most likely contenders for a possible permanent role on the UNSC. Although an effective UNSC is also in the best interests of the P5, there is no reasonable proposal that would induce the P5 to forgo their current veto, through which they can block any resolution. Yet the veto – and the inordinate influence of the P5 within the larger UN system – poisons the entire organisation, which is continues to haemorrhage influence and legitimacy. This is an intolerable situation, given that the world today sees greater levels of instability, violence and flux than possibly any other time in recent history. Africa and the Middle East are the current big losers: the former because its needs UN support on peace and security the most; the latter because it is a tinderbox where the UN cannot engage due to big power rivalry. But ironically, it is the events in the South China Sea that have geo-strategic analysts the most concerned – in part because Asia does not have a regional security mechanism, as is the case with Africa. Only when facing a decisive majority in the UNGA will the P5 relent. Elect the Council has adopted a novel approach. The project is consulting with think tanks and academics globally to formulate proposals for UNSC reform in a way that would balance the competing needs for legitimacy, effectiveness and power politics. These proposals should not entrench the power of any single country, but rather balance the need to include a greater number of powerful countries from all regions with finding an equitable representation formula. In accordance with Article 108 of the UN Charter, Elect the Council advocates for a single resolution to amend the Charter, ‘adopted by a vote of two thirds of the members of the General Assembly [UNGA] and ratified in accordance with their respective constitutional processes by two-thirds of the Members of the United Nations, including all the permanent members of the Security Council’. The Elect the Council proposals will do away with permanent seats on the UNSC and the veto, and map out a system where countries are elected to the UNSC bound to four technical requirements. The criteria are: experience and capacity; being in good financial standing with the UN and its agencies; the willingness to shoulder additional financial contributions to UN efforts on international peace and security, as determined by the UN General Assembly; and respect for open, inclusive and accountable governance, the rule of law and international human rights. These criteria would be managed at a regional level, where, in line with current practice, each electoral region would present their candidates to the UNGA, where actual voting would occur. Regional groups would also be requested to take the interests of cross-regional interest groups into consideration, such as those from the Small Island and Developing States and the Arab group. 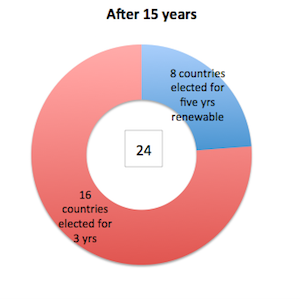 After a 15-year transition period, Elect the Council proposes a 24-member UNSC, Council consisting of eight countries elected for five-year renewable terms, and 16 countries elected for three years (non-renewable). During the 15-year transition period, the P5 will remain members of the Council without the need to stand for election. Three of the P5 members will occupy three of the five-year slots allocated to their respective electoral regions, and the two remaining P5 members will be accommodated in two additional seats. 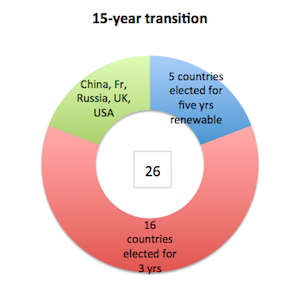 This means that the UNSC will consist of 26 members during the 15-year transition period. After 15 years, the P5 members would need to contest for elections in their respective regions should they wish to remain on the UNSC. The current proposals will also provide the P5 with one of two proposed additional voting privileges during the 15-year transition period. Under Option A, their votes will carry more weight than those of ordinary members of the Security Council, decreasing in weight over time. Under Option B, a decreasing number of former P5 members will be required to support a resolution. Both substantive and procedural decisions within the UNSC would require a two-thirds majority of those present and voting. A mandatory review would occur every 30 years. Today the UNSC is increasingly a divided house – between the power of the majority and the power of the purse, including between those countries that favour a more interventionist approach to peace and security issues, and countries that emphasise national sovereignty. An integrated and interdependent world needs a different solution as populations, trade and challenges expand.